Doughnuts. Pie. Pastries. Coffee cake. Cronuts. These are just a few of the sweet things that are no longer in my culinary repertoire. Do I miss them? Not really. The truth is that the less sugar and carbohydrates I consume, the less I want. It’s a phenomenon. And a beautiful one. But just because I don’t crave carbs and sweets, doesn’t mean I don’t want to eat them. Particularly for special occasions–like the 4th of July and my birthday. It’s times like these when I make the extra effort to prepare something fabulous and preferably unusual. Made with basically four ingredients–almond flour, eggs, Spectrum shortening and coconut sugar–this batter can be made using just two mixing bowls–a big one for the dry ingredients and a small one for the wet ingredients. Simple, quick and good-for-you, make this blueberry coffee cake for brunch, a ladies lunch, for a gathering of guys, or make it for breakfast or serve it for dessert. We found that it got even better after being refrigerated overnight. The taste of summer's finest blueberries along with a bit of coconut sugar gives this almond meal batter just the right amount of sweetness. Use farm fresh eggs to make it even better. While I did love Elana's original recipe, the streusel topping sort of fell off, so I changed it up a bit the second time around and I like it even more this way. Preheat the oven to 350 degrees. Grease an 8-inch round cake pan with shortening and dust with almond flour. To make the topping, cream together the coconut sugar and shortening in a medium bowl. Stir in the almond flour and cinnamon and then sprinkle the topping in the cake pan and shake until it covers the bottom. Set the bowl you made the streusel in aside. To make the cake, combine the almond flour, baking soda and salt in a large bowl. Using the streusel bowl, add the wet ingredients and whisk together the eggs, shortening, coconut sugar and vanilla. Stir the wet into the almond meal mixture and stir until well combined. Then add the blueberries, stirring just until mixed in. Pour the batter into the prepared pan with the streusel already in the bottom. Bake for 30-40 minutes or until a toothpick inserted into the center comes out with just a few crumbs on it. Let the cake cool in the pan for 1 hour. 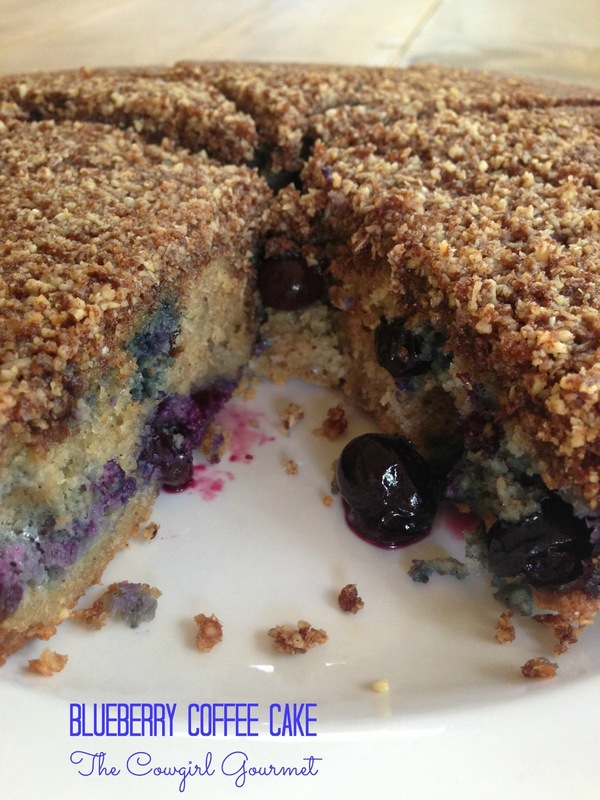 Place a plate over the top of the pan, flip and voila, blueberry coffee cake. Slice and serve. Keep in mind that we thought this was best when served cold along with a dollop of whipped cream and a few more blueberries sprinkled on top.